"The Zero Water Exchange System is designed to eliminate the fish's dependency on water changes in maintaining a safe, healthy aquarium environment. 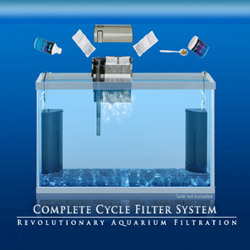 This system consists of an advanced combination system of reversed flow undergravel filter, biologic towers, a hang-on-back power filter, and additives to provide a biologically active, clean environment for both freshwater and saltwater aquariums." You can learn more about the Zero Water Change System by visiting their website. Click here to visit HIQ-USA.com. You can also follow the discussion on the Zero Water Change System on the forum. Click Here To Join The Discussion. I don’t know about never changing my aquarium water but after checking out the eco-magic I think it’s definitely something I would like to have for my severely over stocked tank. I was under the impression that you changed water to remove desolved solids and stuff that needs to be removed/replaced. Not like poo or anything… But like the meds and chemicals you use in aquariums…. This could very well be the product that people have been waiting for to make keeping fish just that much easier and encourage new comers. I fail to see how this is anything more then a reverse UGF – which aren’t that great, but still better then a regular UGF, with an HOB filter on the back into which you toss the Nitrate bags. The UGF portion of this tank is completely unnecessary and could be replaced with any other type of filter. The Nitrate bags are what keeps you from having to do water changes. Even then you’ll still need to vacuum the gravel on occasion, and I really want to know how well those bags actually work. I’m not sold. Smells like snake-oil to me. I would be curious to hear from people who use this system. If it could only allow us to skip a water change once in a while, that would be great. Does any one here tried it? Patrice, two of our members just started testing them in their home aquariums. Their threads are in the Equipment forum. How does it replace buffering capacity on soft water? My KH is 1 out of the tap and quickly falls to 0 within a week. I do 2 x weekly 10 – 20% water changes to keep the KH and pH stable (occasionally adding in a pinch of NaHCO3). Since the tank is planted without doing water changes the pH falls to around 5.5 – 6. This can be dangerous for fish that don’t like blackwater environments (its great for my soft water rasboras and tetras though…). How does it remove excess GH? GH builds up over time due to evaporation. If you keep topping off the tank when it evaporates the GH rises (unless you use distilled water). Rocks and substrate also often leach calcium and magnesium into the water. My tap water’s GH is 10, but my tank GH is 13 – 14 before water changes (even in the tanks with “totally inert” substrates and no rocks). I live in a subtropical climate so evaporation is HIGH here. It’s warm / hot for half of the year here (I do not use tank heaters during this time because the temperature is very stable being a peninsular and surrounded by sea on almost all sides – its more likely a heater thermostat will go on the blink and fry my fish than there will be a sudden temperature drop). I rely on water changes to keep my water chemistry from going way out of whack. Kindly explain how this system can keep water chemistry stable? How does this system remove DOC (Dissolved Organic Carbon)? I was under the impression the only (viable and reliable) way was through water changes.